Are you a member of one of our amazing societies? Or, in the past, have you competed for one of Edge Hill’s sports teams, or come along to any university or Students’ Union events? Here at Edge Hill, there are loads of things to do on campus in addition to your studies. Whether it’s standing on a committee, running for an officer position, or merely just showing your face at Social, every experience is important with regard to making your student experience a memorable one. And this year, we want to make sure more of you can get involved with societies, teams, and events than ever before! Starting at the end of January 2019, our Inclusactivity Campaign will be pushing for societies, departments, sports teams, and event-planners here at Edge Hill to consider the needs of all students. Keep an eye on our social media and webpages for updates of our progress! Do you want to be the one to make a positive in your student society? Or are you running an event on campus and want to make sure it is accessible for everyone? 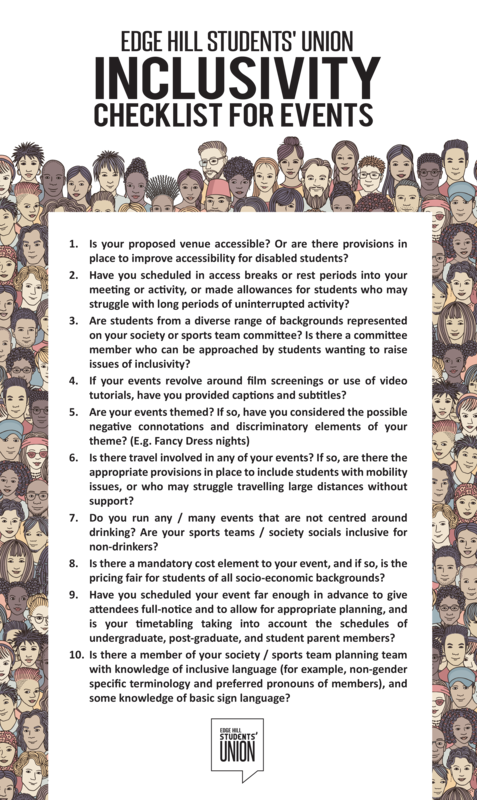 Download and use our Inclusivity Checklist by clicking on the image below!